Why We Like it: A great use of the Google Maps API by a municipal agency to improve the services they provide to their community. Also, it is beautifully designed and a great use of styled maps. For many people the most difficult part about riding public transportation is knowing when your ride will arrive. To take the anxiety out of riding the bus, MTA Bus Time provides real time tracking of New York city’s MTA buses on their Google Maps API implementation. Easy search functionality allows users to find bus lines via intersection, bus route, or bus stop code. It’s easy to see that the NYC MTA spent a lot of time and effort designing this map. Their use of styled maps helps the bus routes stand out better. Additionally, info windows display real time information about the location of the bus and it’s next stop. There are even special bus icons that show which direction the bus is headed. The MTA also produced a great video on YouTube to help riders better understand how this system works. Among the many great features of this system not on the map itself is the ability to access the tool through QR codes posted on bus stops throughout the city. 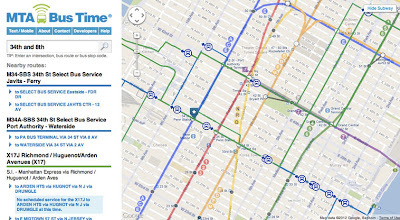 While real-time bus tracking isn’t available across all routes just yet, NYC MTA is planning to have this available system wide by 2013. If you would like to see other real-time public transportation tracking maps, check out SwissTrains.ch, DC Circulator, and Stadtbahn Tracker.